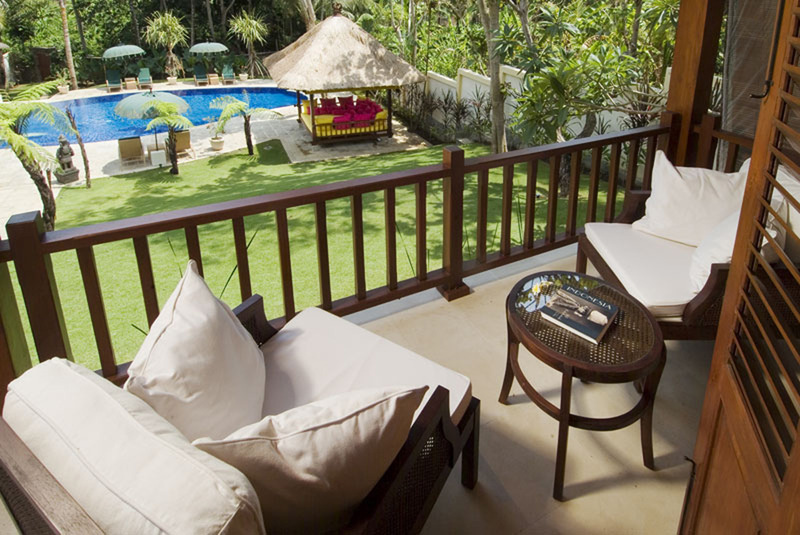 From $ 508AUD per night We have direct contracts with most villa owners. We don't add any booking fees. We are 100% transparent with no nasty surprises. 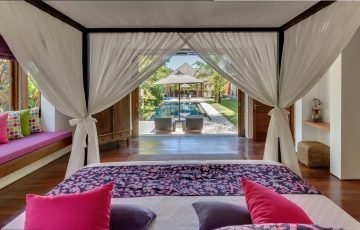 Villa Mako is a 3 bedroom Canggu villa holiday rental & is just a few minutes drive to the great waves, shops, sun baking and seafood barbecues of Echo Beach. 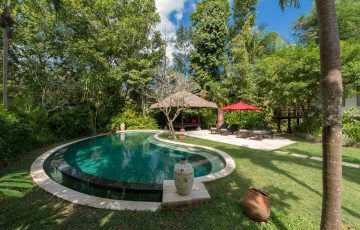 This wonderful large Bali villa in Canggu sits above a huge garden with an electric blue free- form swimming pool and lush tropical backdrop. 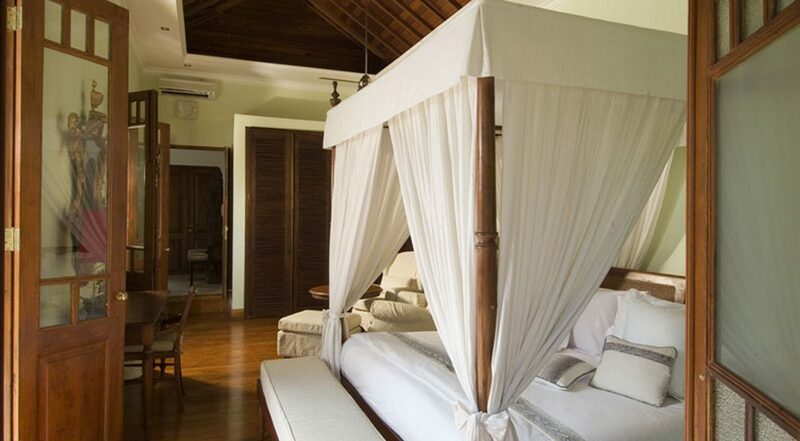 The spacious bedrooms and living areas are beautifully decorated with fine antiquities from around the archipelago. 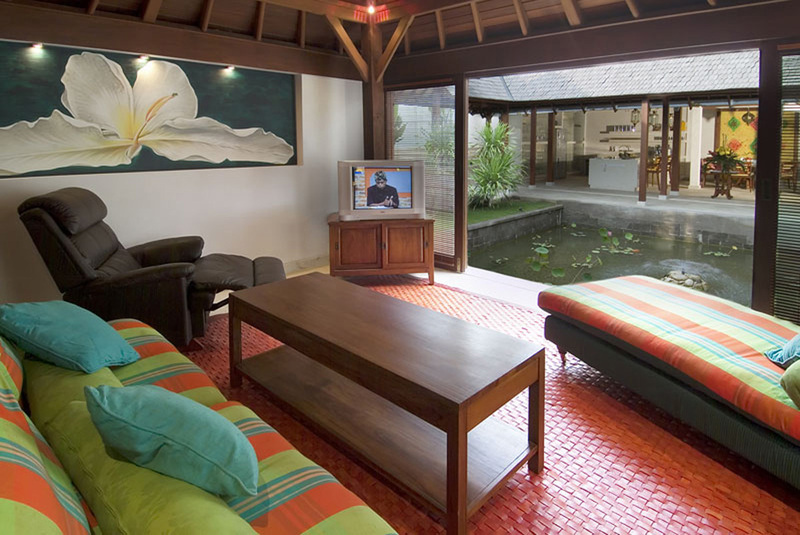 Villa Mako will satisfy the most discerning of travelers, the perfect holiday villa for a family or group of friends. 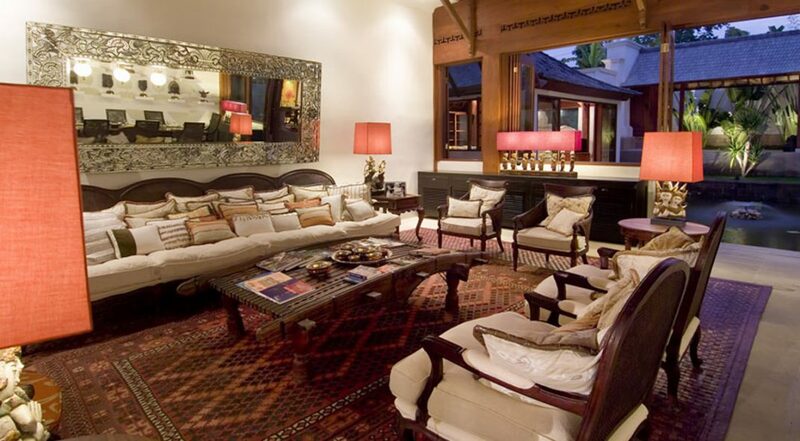 Villa Mako is laid out over some 2000 sq mtrs; the villa is elevated above the extensive outdoor garden and pool area. 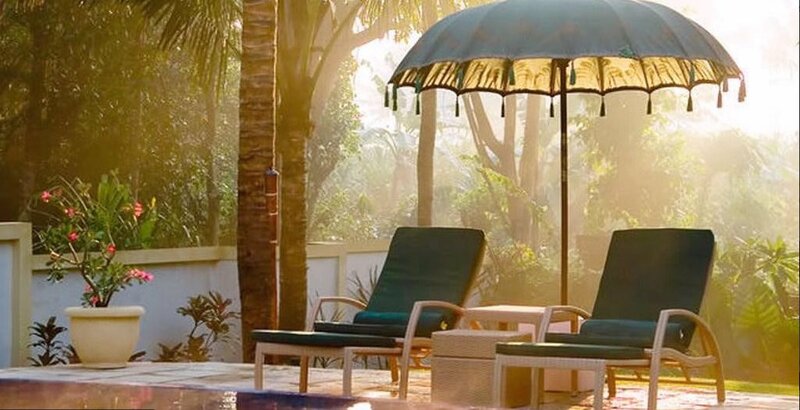 Manicured grass lawns roll down to the poolside terrace, spotted with comfortable sun lounges and traditional Balinese parasols providing shade with a tropical backdrop to something akin to “gorillas in the mist”. A traditional thatched roofed bale is decorated with vibrant cushions, perfect for enjoying a paperback or maybe an afternoon siesta. The pool has a shallow area for the kids and the chef is on hand to cook a barbecue lunch or dinner for you for all to enjoy by the pool. 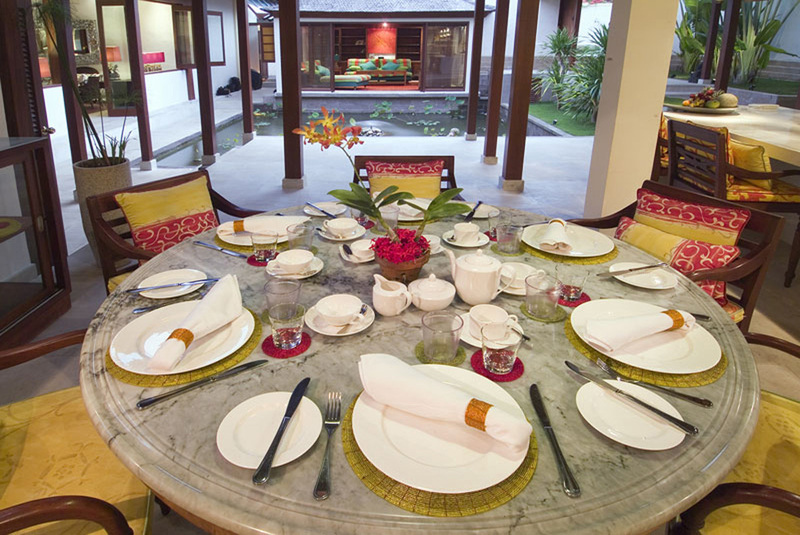 There is an antique marble dining table, set in fine bone china residing by a calming lotus pond. Circular in shape and accompanied by antique cushioned chairs, a Ming Dynasty ambience is created, as you enjoy your breakfast prepared by the skilled chef. A more formal dining table with high back chairs comfortable seats up to 8 guests. 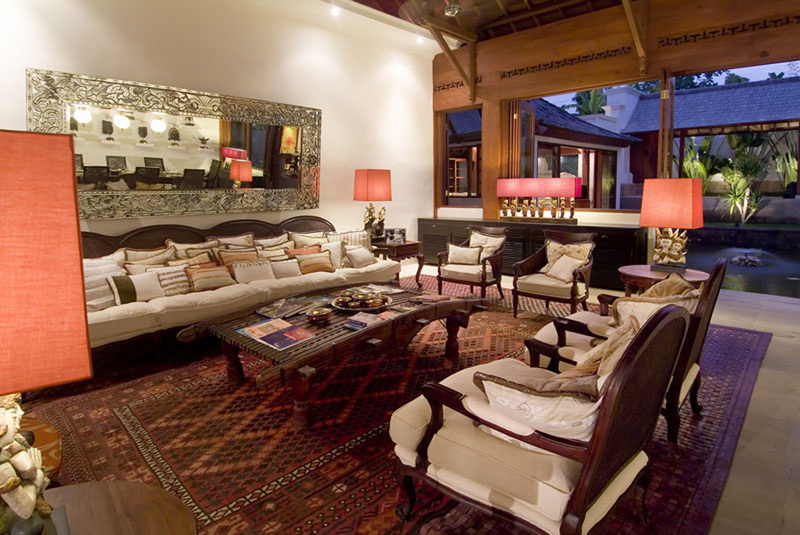 An adjacent lounge area offers plenty of space for guests to relax and converse while a smaller air-conditioned media room overlooks the large lotus pond. 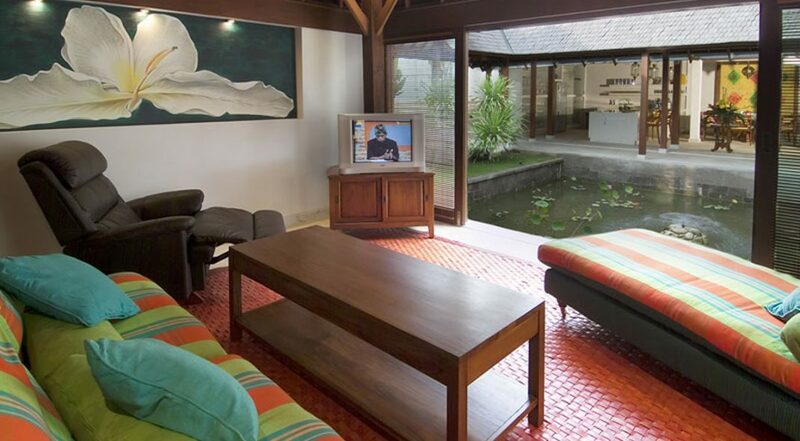 Villa Mako provides high speed WiFi internet access, TV, games as well as sound system and iPod-docks around the villa. Two of the three bedrooms offer king size beds while the third features a double and a single bed. The two king suites with access to a private balcony providing views over the pool offer a relaxing place to sit with a morning coffee. 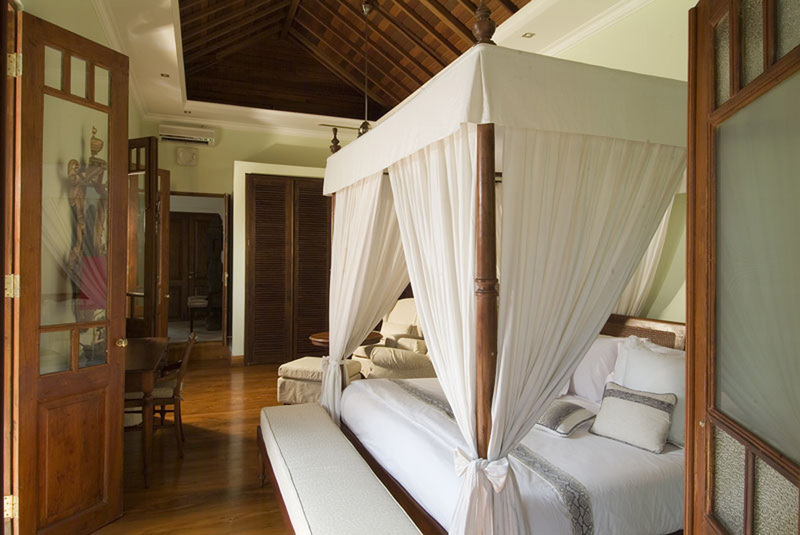 Rich timber floors, four poster beds and fine furnishings combine to deliver opulent sleeping quarters. 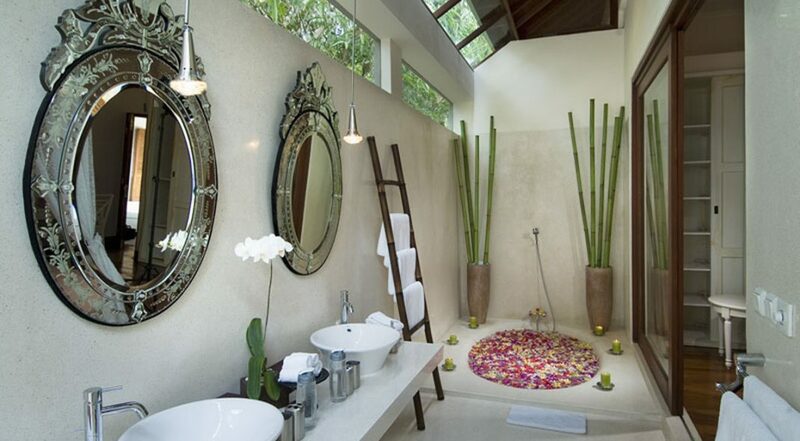 The en-suites with sunken soaking baths, monsoon showers, and twin vanities provide for wonderful pampering for the lucky guests. 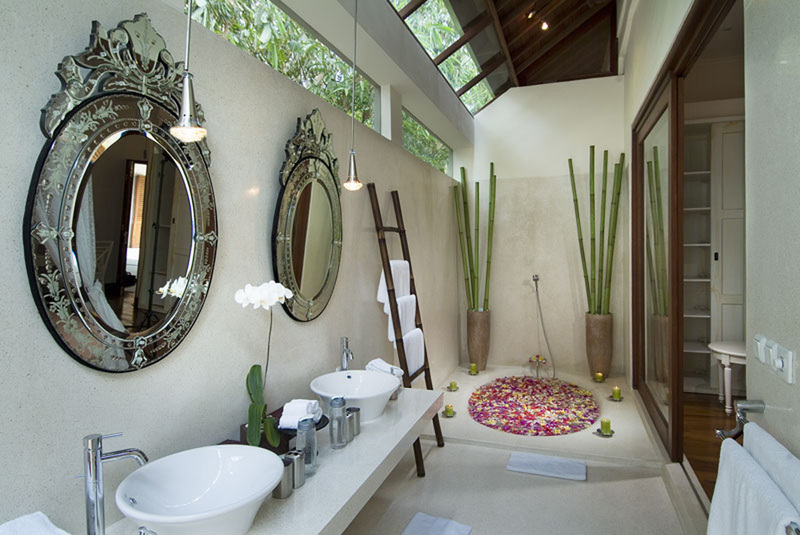 At Villa Mako you will be subjected to an exceptional level of service. Your personal chef will take pride in cooking sumptuous meals to meet your personal tastes. 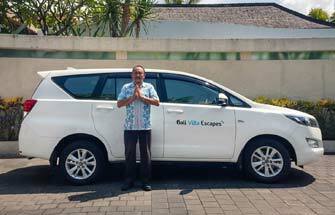 The housekeeping staff will maintain the villa impeccably and the team of butlers and villa manager will see to your every need. 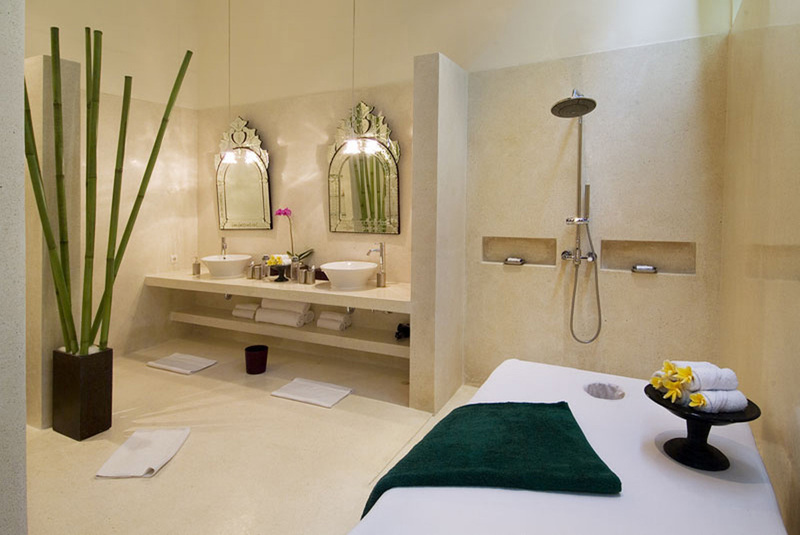 Don’t hesitate to ask the staff to assist in arranging masseuses, babysitters, car rentals and chauffeurs at any time. 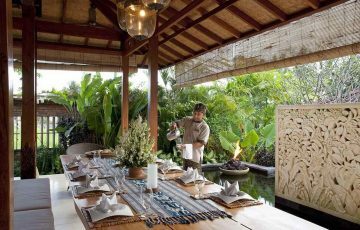 Set within a rural setting not far from the beach, Villa Mako offers guests a quiet and private holiday escape. Echo Beach with a great seafood BBQ, cafes and great waves is a short drive from the villa. 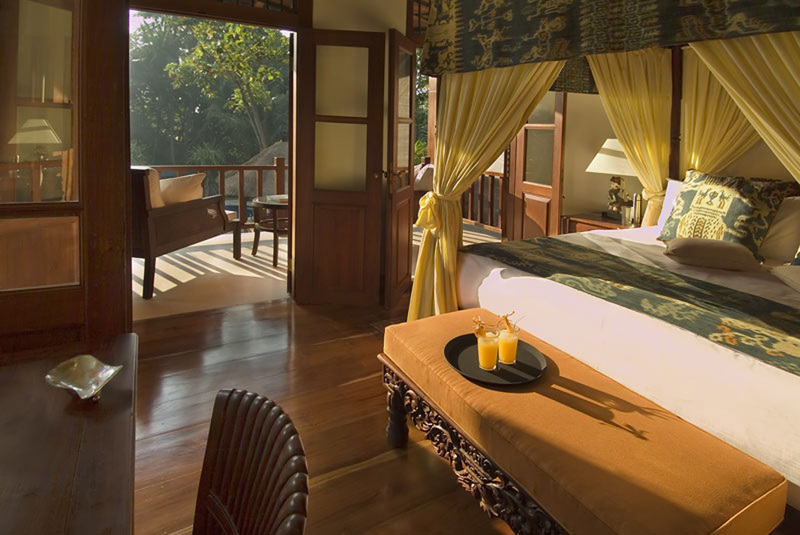 The Tanah Lot Temple and Greg Norman Designed 18 – hole championship golf course is only a ten minute drive. The bustling, vibrant and exciting Seminyak, only a 20 minute drive provides guests with a huge choice of dining and shopping options. 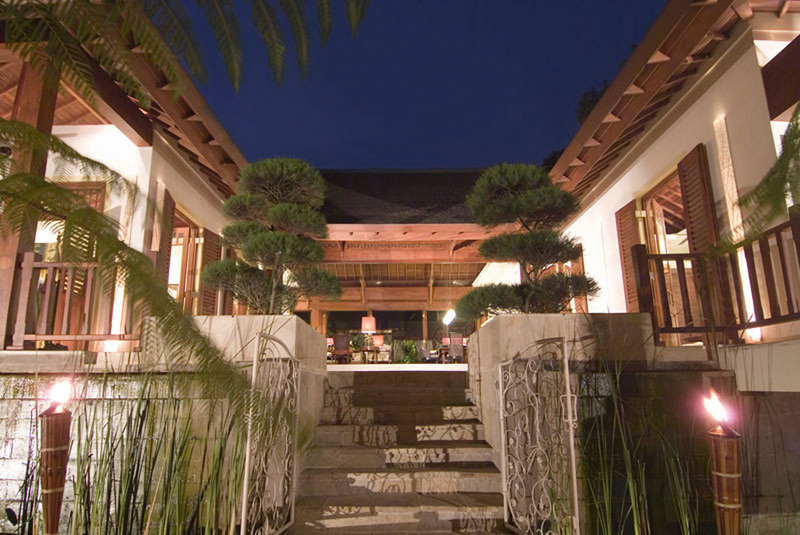 Canggu centrals main shopping and dining area Jalan Batu Bolong is also nearby where you can take the kids for a meal or a night out. Make sure you try: Old Man’s, The Lawn, Betelnut, Deus, Fishbone and Crate. 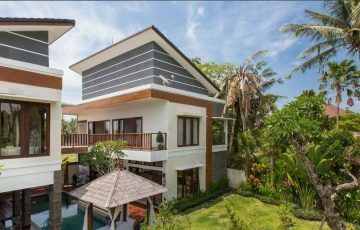 To view other family friendly Canggu villas or our full range of lovely Bali villas to rent please browse this website or contact our reservation team. 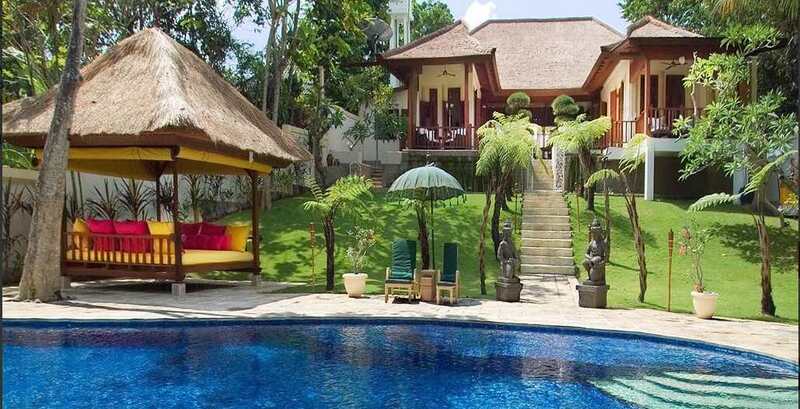 This is a popular Canggu holiday villa so if your planning a trip to Bali, especially during the Australian school or public holidays please book Villa Mako well in advance. What a fabulous holiday experience we had at Villa Mako. A huge hi to the staff who by the end of our 10 day stay knew our names and what we liked for breakfast. A quiet and peaceful location really made our family holiday here even better. We came here with 3 kids who absolutely loved the pool. We on the other hand were happy to relax by the pool and soak up the atmosphere. For us we just wanted lots of downtime and we certainly got it here. The villa is in an area that's about 10 mins to Canggu central so getting there was really easy for some shopping. My husband loves surfing so he rented a scooter and it literally took him 5 min to get to the waves at Echo Beach. Highly recommended. 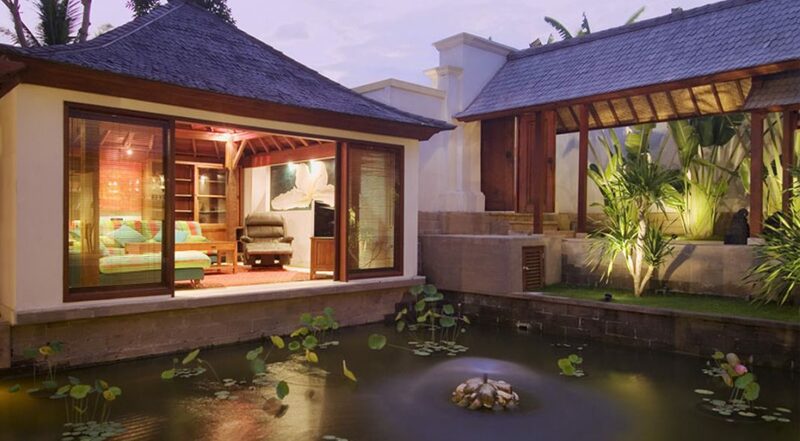 We wanted to escape the cold winter so a few weeks in Bali is just what we were looking for. We also wanted a villa that could comfortable fit the 5 of us. 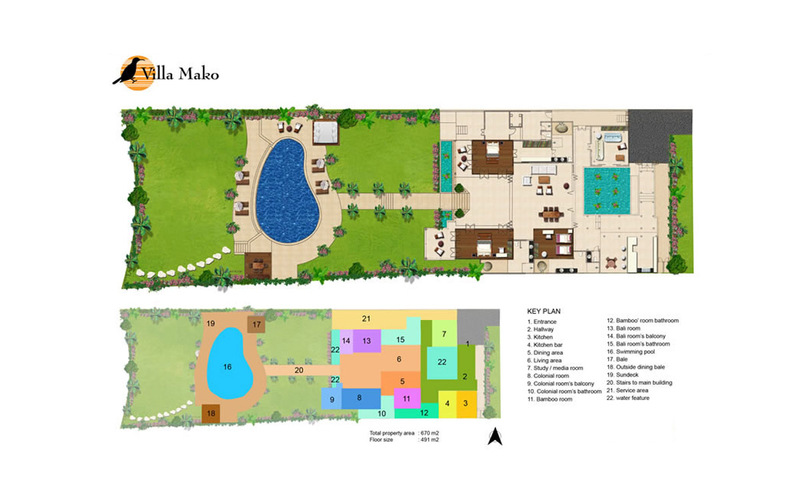 After a few hours of searching online we finally found villa Mako. What a great choice and just the tonic for warming us up and helping us get over those winter blues. Staff, facilities and rooms were excellent. Fabulous time, clean villa, really top staff and a peaceful location where you didn't hear a thing except the sounds of nature...what bliss!! Everything about villa Mako was perfect. Great location, close to beach with really good wifi which was important for me. Very helpful and friendly staff who made my staff even better. I can here with 3 other girlfriends and we all agree that this was a top villa. 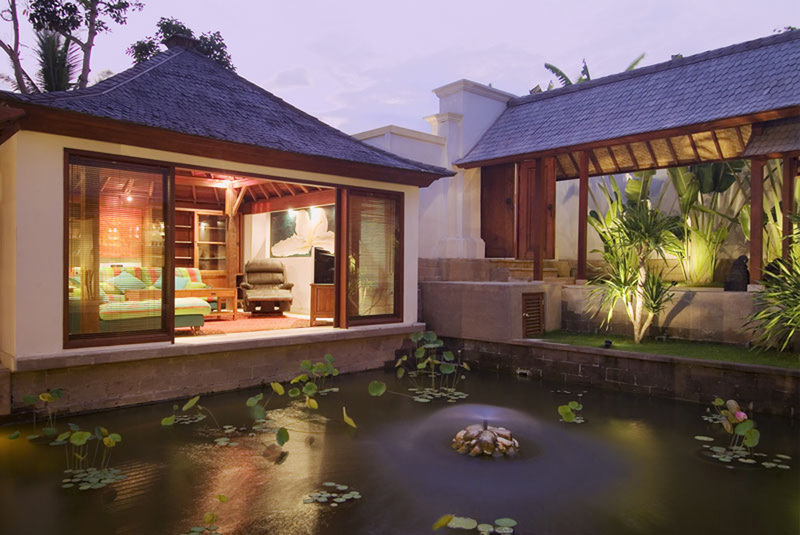 Along with lots of sightseeing and loads of shopping, staying at Villa Mako was the highlight of our holiday. We had such a wonderful time and my children are already begging me to come back. 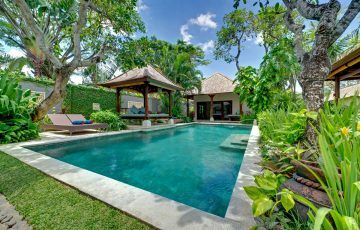 We especially enjoyed the private and very peaceful location, PLUS the villa staff were amazing who made sure our stay was so relaxing. As first timers to the Canggu area we can honestly say that we prefer being out there. It has it's own magical ambiance. We will be back! To all the staff at Villa Mako, your the best - thanks for such a wonderful holiday.